The 2400 mesh chair from Office Star combines the breathability and sleek look of a matrex mesh back and the comfort of a padded leather seat. The chair offers an adjustable lumbar support that easily allows you to move the lumbar support to where it fits best in your lumbar area. The arms are adjustable in height and the polyurethane arm pads are comfortable and durable. 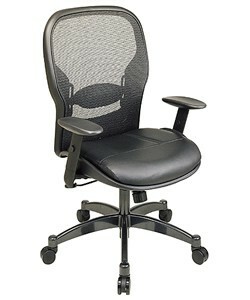 The chair offers a comfortable rocking motion that can be locked in an upright position. Fabrics represented in photo may not correspond to fabric colors currently available. Seat width of 20" and depth of 19.5"
Back width of 22.5" and height of 25.75"